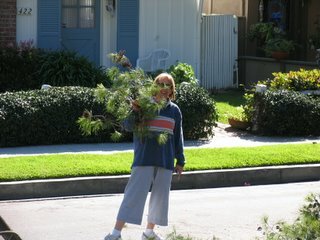 The Blog Formerly Known As The Blue Cottage: It Was Raining Pine Needles! 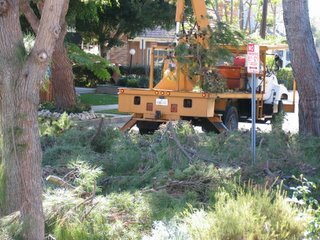 There is nothing like the sound of chain saws in the morning ;-) Yesterday the Heliotrope pine trees got a buzz-cut -- Kimber has only been after the tree-trimming honcho for weeks to get this done! 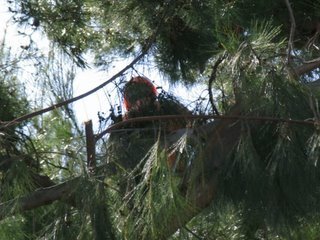 I had to document the tree-trimming Dude in Kimber's tree. I won't say Kimber was supervising...but when she donned the orange hard hat and grabbed a chain saw I was a wee bit concerned.... 0kay, I've gone out on a limb with that one...however, she did want a ride in the bucket!